Make it Simple - Make it Smart! SoftPLC Corporation's new "Smart" product family provides industrial Ethernet routers, protocol converters, and feature-rich PAC's (Programmable Automation Controllers), all on the same low-cost hardware platform. Reduce costs & save panel space with these multi-function products! Smart Netbox: Combination switch/router, media converter, remote access modem, firewall/VPN, and serial device server. Smart Gateway: Protocol Converters including Ethernet, serial & field bus network conversions; multitudes of combinations, with up to 16 protocols in a single Gateway. Smart SoftPLC: Open architecture PAC suitable for small machine controls up through sophisticated distributed process control applications, extensive communications, rich instruction set, customizable functions, and more. 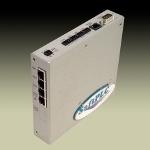 Smart Adapter: Remote Ethernet I/O Interface for SoftPLC's Tealware I/O system for SoftPLC's controllers or other systems that support ModbusTCP I/O. FREE programming software with your first Smart Gateway or Smart SoftPLC purchased by April 30, 2010! Recently, an OEM compared the purchase price of their control system using Rockwell Automation versus SoftPLC products. The existing system includes a CompactLogix CPU with Flex I/O, a 12" PanelView Plus, and a 9300-RADES remote access modem/switch. The equivalent system includes a Smart SoftPLC with embedded modem/switch, Tealware I/O and a 12" SoftPLC Web Studio HMI. And, this does not include savings due to a reduction in required panel size! Click images for event information. Contact SoftPLC for free exhibit passes.